Outside of the main storyline, there's a veritable cornucopia of side-missions, minigames, and other distractions to choose from. But they are formatted to the point of absurdity and their quality is inconsistent to say the least. Easily the weakest are the "Gang Hideout" missions, which are similar to the bulk of the story missions described earlier, but with the added clause that must you knock out the leader of each gang "to teach them a lesson", as Aiden puts it. Given you can kill every other member of the gang without repercussion, this makes absolutely no sense. More entertaining are the "Criminal Convoy" missions, requiring you to ambush a convoy and kill a particular individual travelling along a certain route. These make far better use of the city, letting you play with the environment, setting up traps using equipment like sticky bombs, or hackable objects like traffic lights or "steam pipes" that rupture the road from underground in spectacular fashion. Then there are "Fixer" missions, which are driving scenarios of varying sub-types. Included within these are "Interception" missions that are the best in the entire game. They require you to get close to a vehicle and hack information from the "Fixer"while chasing them through the city and avoiding the reinforcements they inevitably call. Once the hack is complete, you must then take out the Fixer permanently. Admittedly, this doesn't make much sense either, as you could just kill them and then nick their phone. On the plus side, racing through the city causing absolute chaos is wickedly entertaining. 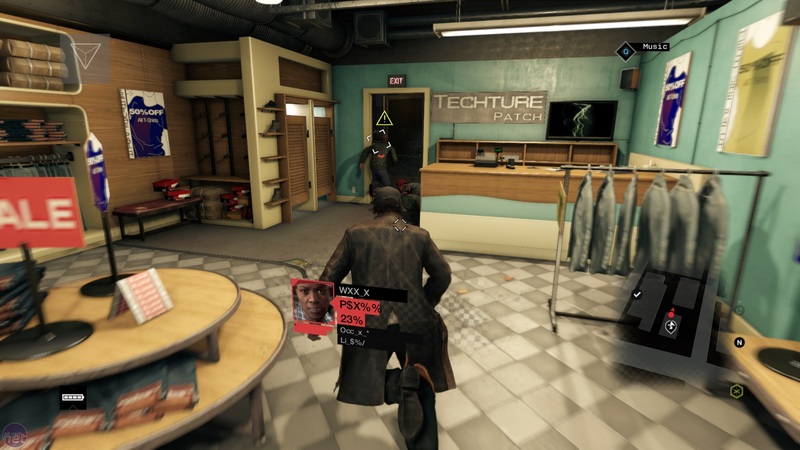 The reason for this is that Watch Dogs has some truly excellent chase mechanics. It's the one area where it excels, because it's where all of the game's mechanics come together. During one Interception mission, I took out the driver by hacking a set of traffic lights, causing a pile up at a crossroads next to a bridge. Getting out the car and finishing him off, I realised he'd called in reinforcements. Lots of them. Massively outnumbered, I skittered down a rocky slope and sprinted to a train station, hacking the train before it could leave and leaping aboard. I hoped this would be enough to dissuade my pursuers, but still a few cars chased on, so I stopped the train near a car park, jumped in a vehicle, then drove through roads and alleyways hacking anything that might stop my pursuers, steam pipes, bollards, the works. Yet this still wasn't sufficient, and in the end I took out the final two Fixers by stopping in the middle of the road, using my car as cover and blasting their vehicles with a grenade launcher. When Watch Dogs actually uses the beautiful and intricately detailed render of Chicago Ubisoft Montreal have created, it is barrels of fun. 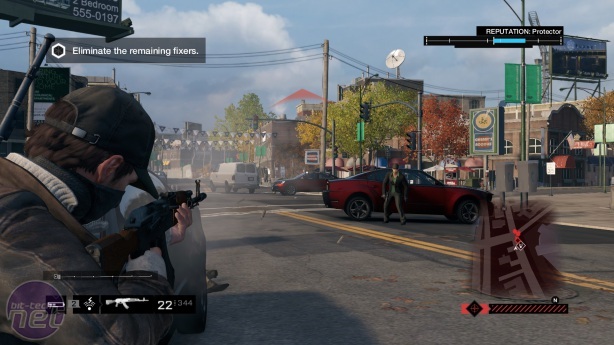 Two other good examples of Watch Dogs' better side are the random crimes you can intervene in and the multiplayer invasion missions. Crimes involve tracking either a potential suspect or victim using your phone, and then leaping from the shadows like a less impressive Batman when the crime is being committed, chasing the perpetrator through the streets. Chicago's bevy of alleyways and side paths make it a great place to dash through on foot. Regarding invasions, from time to time your vigilantism will be rudely interrupted by other player Fixers stepping into your world and hacking your phone. In order to stop this, you must find the other player, who will be hidden within a certain radius of your location, and then dispatch them before they can escape. Again, this makes brilliant use of the city, as you frantically search every parked car and every back alley for your opponent, and then chase them across town when they inevitably leap in a vehicle once spotted. This is of course assuming multiplayer actually works given it relies on Ubisoft's phenomenally awful Uplay service. 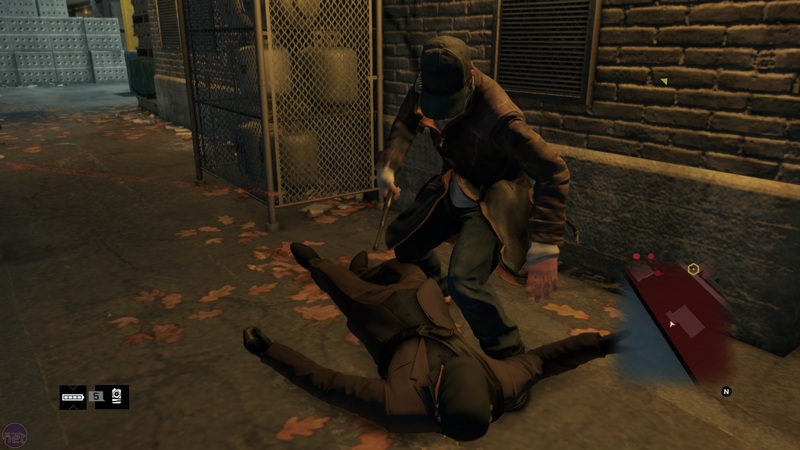 The problem is all of Watch Dogs' strongest assets are side-attractions, and none of it feeds logically into the story or your character development. 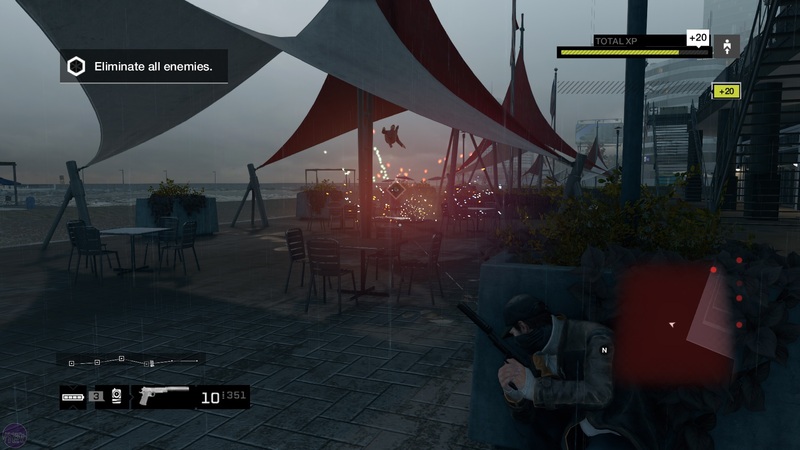 Compared to Ubisoft's other open world games like Far Cry 3 or Assassin's Creed IV, where doing all the optional missions made sense because you were looking to upgrade something or access a new area , Watch Dogs feels remarkably fragmentary and arbitrary. The result is the novelty of these smaller attractions soon wears off, and you're left with a story that only gets more monotonous as it goes along. Watch Dogs is not a hacking game, but this isn't ultimately the issue. It is constantly trying to be a hacking game that causes the majority the problems, both in terms of storytelling and mechanics. It feels like the developers have struggled with the hacking concept at almost every level, trying to crowbar a process that is complex and usually done sat in a chair into a game that needs it to be simple and involves a lot of running around. It's still possible to enjoy yourself, but only if you ignore many of the ways Ubisoft intended you to do so, which once you've stopped marvelling at the amazing city and the hacking gimmickry, reveals itself to be pretty poor game design.